Welcome back to our comprehensive guide on How To Be A Master Chef for beginners and food enthusiasts! In today’s posts, we’ll go over baking basics such as measurements, ingredients, techniques, and a simple recipe to get you started! If you’ve ever wanted to be a master chef, the time is now, so let’s get started! Don’t miss our guide on How To Grill Like A Master Chef: Tips, Techniques, & Recipes! 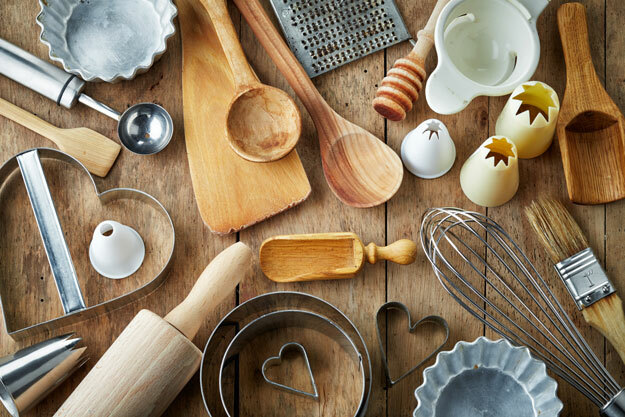 Learn basic baking terms, what supplies you’ll need & more! Some people may see baking as intimidating, but the truth is that it can be a lot of fun once you learn the basics. Over the course of this guide, we will go over the basics and open your eyes to the fun that is involved when baking! Measurements will be your best friend for this cooking style! Make sure you measure everything accurately! When baking, measurements are the main element that creates texture and flavor. Without properly measuring, bread can turn into a cake! To measure dry ingredients (flour, sugar, etc. ), you’ll need to use a dry measuring cup with a flat top. There are also measuring spoons that work. Measuring flour and sugar are done in the same fashion. Fluff up the powder and scoop out more than what you need. Then, use the flat side of your knife to level off the excess powder. This is called leveling. When a recipe asks for sifted flour, you’re going to have to sift it prior to measuring. This changes the volume of the flour. This makes the flour lighter so be careful not to compress it when measuring. Measuring wet ingredients (liquids) means you’re going to need to use liquid measuring cups. These cups have spouts that allow you to pour the liquids. There are measurements along the sides of the cups, making it easy to measure liquid ingredients. Make sure that the liquid is exactly at the line where your measurement is written! These are techniques that are used for measuring certain ingredients. For example, with brown sugar, you have to pack it tightly into a measuring cup by pressing it down. Shortening and peanut butter use the same measuring technique. Don’t be intimidated by eggs; master them! Do not include the shell in your dish! Eggs need to be cracked, and the insides are put in recipes. Through this post, we will show you how to use your eggs and even how to separate the yolk from the white! Grasp an egg in one of your hands. Lightly knock the egg on the side of a bowl to break the shell. Be gentle! Use your thumbs to open the crack and open the egg. Again, be gentle! If you are not gentle, you may break off pieces of the shell! Allow the insides to go into your bowl. Make sure to take out any shell fragments! 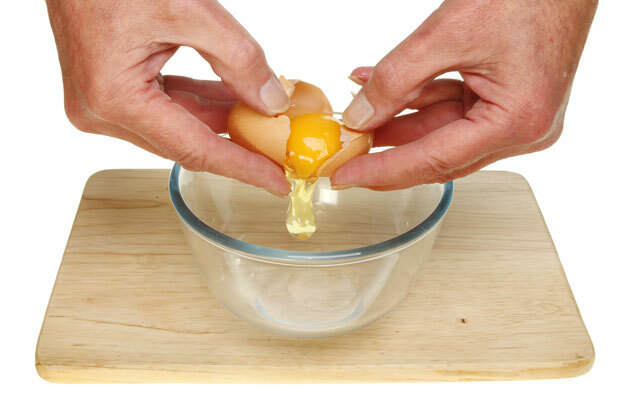 Take the egg and crack it in half by tapping it on the side of a bowl (gently). Open the egg, allowing the insides to be in one side of the shell. Over a bowl, pass the yolk between the two sides of the shell until the only the yolk is left in the shell. Toss the yolk in the garbage disposal. Beating: This is when ingredients are mixed vigorously using a circular motion. Stirring: Combining ingredients through moving ingredients around (usually done in a bowl). Whipping: This is when air is added into the ingredients using a whisk or electric beater that has a whisk attachment. Creaming: Using your hands or an electric mixer to beat butter, shortening, or margarine with sugar until it becomes light and fluffy. Kneading: This combines pushing, folding and pressing to take the dough and form the gluten. This gives the dough a smooth and stretchy texture, allowing it to rise. Folding: Combining light and heavy mixtures. This is done by literally folding the mixture over itself. Whisking: Using a wire whisk to combine ingredients in order to put air into the mix.